Welcome back to part two of our series on courtroom terminology. There are enough unique and interesting legal terms to fill a dictionary. Many of these terms have been around for a long, long time. In fact, a good deal of them have been derived from the Latin language. 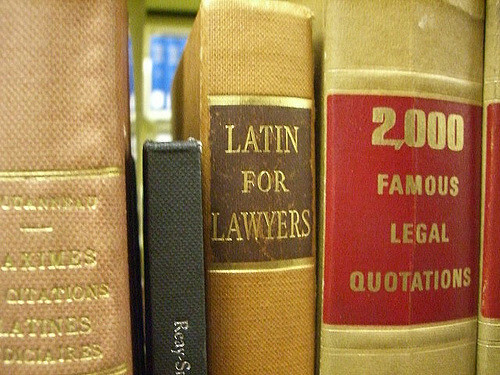 Luckily, you don’t need to be a Latin scholar or a trained lawyer to understand them. Let’s get into it. Habeas Corpus – A writ of habeas corpus is used when a prisoner wants to argue the legality of his/her imprisonment. They may believe that have been wrongly imprisoned, or that there is not sufficient cause for them to be imprisoned. Impeachment – Simply put, impeachment means to “call into question.” For example, the testimony of a witness can be impeached. If it is proven that a witness has lied under oath, their testimony will be thrown out because they are no longer a credible witness. Impeachment is also the process in which the House of Representatives may place members of the federal government on trial, meaning they are calling those representatives “into question” for whatever reason. Jurisdiction – Jurisdiction describes the area over which a court has the legal authority to hear a case and deliver a result. Occasionally, two courts can have jurisdictions over a case. Jurisprudence – Refers to a “legal system,” such as American jurisprudence. It also refers to the study and philosophy of law and legal systems. Nolo Contendere – A plea of “no contest.” In criminal court, this is the same as a guilty plea, although for some purposes it will not be considered an admission of guilt. A plea of nolo contendere may force the prosecutor to prove a crime was committed by the defendant. Plea Bargain – An agreement made between the defendant and the prosecutor. The defendant agrees to plead guilty in return for a commuted sentence, lesser charges, or other concessions made by the prosecution. If multiple charges have been brought against the defendant, prosecution may agree to drop some of the charges if the defendant pleads guilt to one of them.